With spatula in hand, I turned toward the pool area to listen for any further sounds. There was no flapping of wings or familiar noises that a duck would make. There was no scurrying of feet or barking to indicate that one of my dogs had decided to go for a swim. So, what had just landed? I closed the lid on the grill and cautiously walked up the stairs to look over the fence. I saw a small head frantically trying to stay above water as it paddled to get out of the deep end. For months the structure had sat uncovered collecting melting snow, rain water and every leaf that blew in. The shallow part had no water, so this unfortunate creature had found itself in a cesspool of unattended crud. From my vantage point, I could not tell what it was. At first glance, it appeared to be an otter, however, that idea faded when I saw the small animal finally reach dry land and flop down. “No! No! No!” was my mantra as I rushed back hoping she was wrong. While the one panted in a heap after its Olympic medal swim, another was leaning up against the side of the pool looking rather dejected as if all of its attempts to escape had been depleted. I talked non-stop in sentences that made absolute no sense as I tried to extend the pole to try to keep the animal as far from me as possible on the off chance that I was able to capture it. I pretended to casually remove leaves as I slowly edged closer to the one that was fighting exhaustion. Just as I was closing in, he took off back into the water with one leap. “I am trying to help you!” I reasoned. Finally, I was able to get him into the net while he chattered and bared his teeth. I had visions of dirty fangs dripping with rabies biting into my hands as I hauled the screaming furball over the fence and into the yard. With a quick shake, he was slightly airborne, hit the ground running and scampered half way up the tree. He turned to stare me down. “I can’t do this again,” I said looking at the other frightened little one. As I pondered how to remove the next one, a terrible smell surrounded me. I looked down into the black water and realized what was going on. A few days prior, and from a longer distance away, I had noticed what I thought were two large leaves floating near the surface. Now on closer examination I could see two bushy tails bobbing along. I ran to get a large trash bin with a garbage bag inside. “I can’t do this!” I shrieked as I reluctantly put my net back in the water. 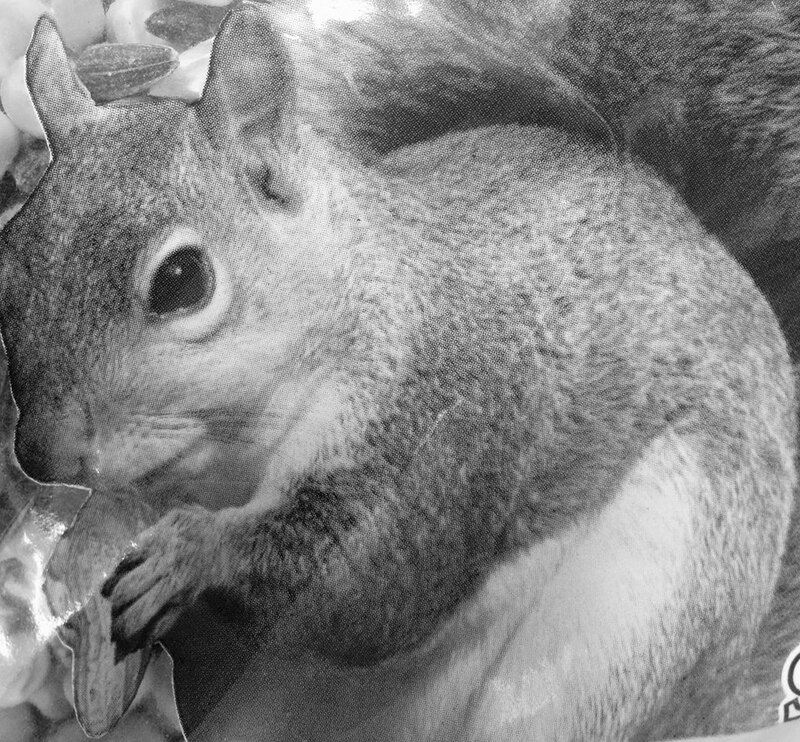 Bringing it up, I had unearthed a bloated adult squirrel that I quickly disposed of. “Aw! Yuck! Some of the water splashed on my legs! I need an entire hot soapy shower!” I had lost my ability to talk quietly. The yelling at the top of my lungs was coming naturally as a way to release my disgust as this horror show was playing itself out. Quickly, I retrieved the second one and then turned my attention to the living. With all my verbal outbursts, I had only scared him more. Of course, he took off like his brother, but the three other rescues had made my net handling skills sharper. In no time, he was flying up the nearest tree to recuperate from his harrowing backyard adventure. For the remainder of the evening, I kept checking to see if all was well. I ended up getting a snow shovel and moved one of the two to the front yard. He obviously was in some sort of shock. It clung to the earth with its claws as I hefted him gently out of harm’s way. By dark, both had left, and I thought that was the end of it. A few days later, I heard another splash. Looking over the fence, I could see another one swimming rapidly. This was followed up by more of the same water fighting, snarling teeth and screeching by me and the baby squirrel before I got him to safety. This time, he ran as far away as he possibly could. I wasn’t sure if it was one of the original two I had saved, but my initial thought was that maybe he had to come back to see if his parents really were no longer living. Why would it revisit a place that had brought it so much pain and agony? As I stood there, I began to wonder why I do that sometimes. How many times do I go back mentally to some horrible situation and relive what was said or done to me that was traumatic? Why is it so easy to let myself go there instead of staying in the present moment and let bygones be bygones? Why can’t I just let the dead things of former days go? When I have found myself in the throes of an old memory that is dredging up emotions that I thought I had gotten past, God is always holding out the net saying, “I am trying to help you! Get out of the muck!” And, like the helpless animal, I have snarled, resisted and made my own self miserable when I didn’t have to. Why not? Why is it not good to continually go back over and dwell on those mistakes and negative issues from a former time? If I am so preoccupied with what has happened to me before, I will not be able to focus on what I want to happen to me now. If I let my past take up all of my thinking today, then that leaves no room for a new and good thing to take its place tomorrow. I have found that to stop myself from unnecessarily going back in time, I must stay on top of my thoughts and allow myself only to dwell on things that will advance me forward into living a better life. Being fully aware that God is with me as a constant companion also restores my peace. I can pray, release and let go of those things that have caused me pain and not fall into the trap of acting squirrelly.